My reading the past two months has been lackluster. The best of intentions, but lack of BEING intentional. The Traveler’s Gift– This book has really mixed reviews, but the combination of history mixed with motivational speaking really hooked me. Dirty God– It was just ok. I really wanted to like this more! Smart Money, Smart Kids– This is Dave Ramsey’s book with his daughter, Rachel Cruze. The central theme was how the Ramsey kids were raised to understand money, along with some practical tips on raising money-smart children. I took away a few good ideas and would recommend this quick read for all parents. The Meaning of Marriage– Maybe one of the best books I have ever read on the subject of marriage. Tim Keller gives the perfect balance of Gospel and application. Married for over 30 years, the Kellers don’t sugar coat the trials of marriage, but they also give lots of hope and even spend some time talking about singledom. A must read for Christians. I’m Happy For You (Sort of… not really)– This title grabbed my attention at the library, because I would say that comparison is something that I struggle with. Kangaroo Dreaming– Because I can’t refuse a book about a roadtrip around Australia. Out of print, I found this at the library. 15 Invaluable Laws of Growth– This is my morning read so I move through it very slowly. 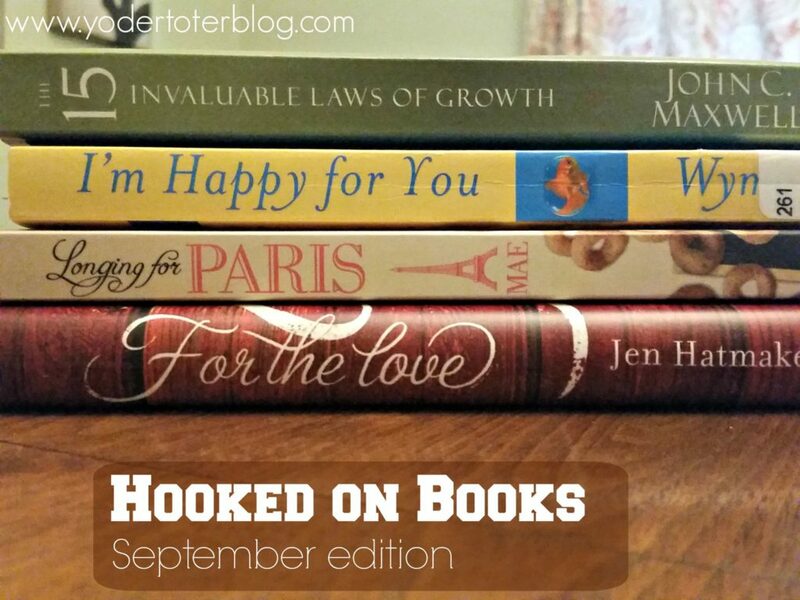 For the Love – I adore Jen Hatmaker and living with more grace is just what I need! Can’t wait to read this! Longing for Paris– Sarah Mae is another blogger/author to whom I can relate. After listening to a podcast where she talks about the book, I’m even more dive in. Any that you’ve read or want to read? Here are my June and July updates. You can check out my Pinterest books list here. Some of the links above are Amazon affiliate links. I would make about 22 cents if you decided to purchase a book.